Work finally started three weeks ago at Castell House to replace the stairwell tiles which were removed in late January 2016. It was a slow start as someone went round with some cement, filling in the areas that had been hacked out by MITIE workers at the beginning of the year. 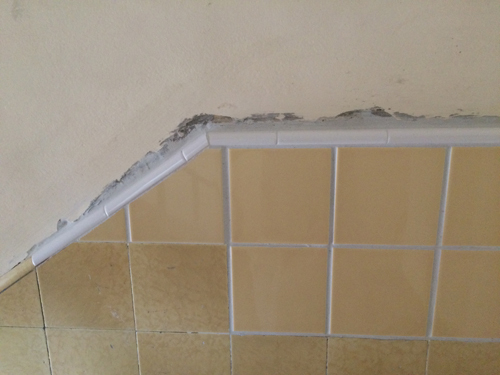 This seemed an odd thing to do because if the work followed the same procedure as other stairwells, there would be no room for the specially made 6mm deep tiles that were supposed to replace the hacked out heritage tiles. The following week, someone went round with some white gunk, but left the job unfinished. Finally this week new tiles were added. They were the same tiles that had just gone up on Farrer's walls – a much thinner and smaller tile not at all like the originals. That explained why the hacked off areas needed to be filled in before the new tiles were added. 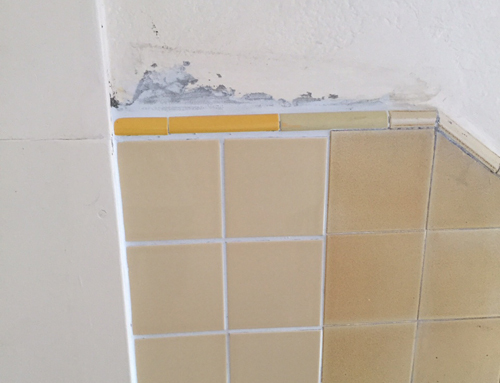 It turned out that the Major Works team had failed to get a match for the original yellow heritage tiles. 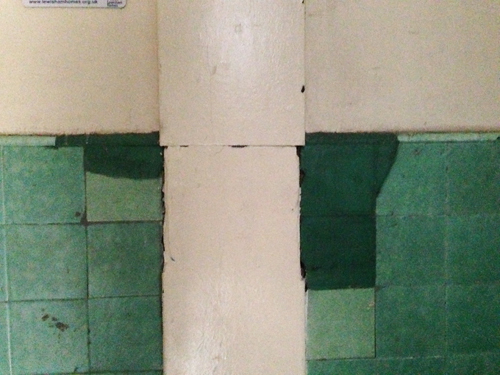 Farrer's block rep was told, "...there have been numerous attempts to gain approval from planning and conservation around the matching of tiles. A number of suppliers provided a good initial match but then failed to replicate this in bulk. There has been a lot of to-ing and fro-ing with different sample boards and test patches onsite which eventually led to an approved product last week." They could not find a match at all for the coving tiles – so Farrer got bright yellow ones and Castell now has white ones. And because the tiles are a few millimetres smaller than the old ones, the grouting is three times as wide. 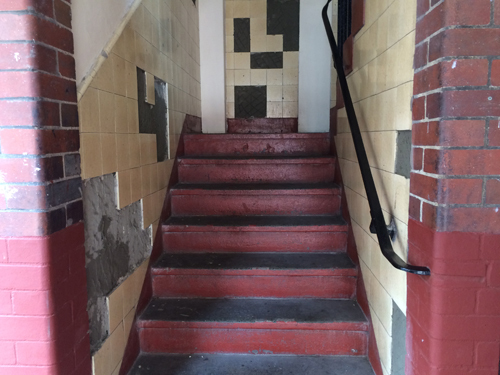 The tile work on the three stairwells at Wilshaw House (which has the same green tiles as Holden) wasn't completed until June. 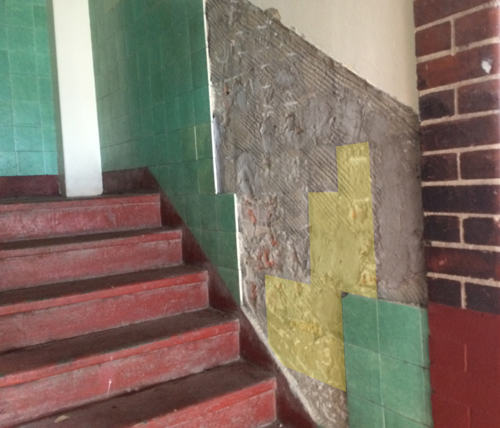 Cremer House residents had to wait until April for their slightly darker green tiles on their single stairwell. Luckily for Browne House, their blue tiles (quite a difficult colour match) were deemed not to need replacing. Finch and Congers do not have tiled stairwells, so escaped the months of waiting. 431007: Wall Tiles: Clean off walls, fix new ne 152x152x6mm glazed ceramic wall tiles to splashback and cills with adhesive, grout, edge strips, cutting, hack off glazed wall tiling, making good, remove spoil. Staircase wall tiling – allowance to repair any missing areas prior to decoration. £37.12 per sqm. Quantity: 30. Residents queried the item since the proposed work was cosmetic and had nothing to do with the aims of Decent Homes (to keep residents warm, safe and dry) for which government funding had been granted. We wanted a solution to the stairs themselves – to have them cleaned and possibly repainted because they are spectacularly filthy (but the Major Works team had other ideas and the stair problem remains unresolved). They also wanted to include tiles that had small pits in them where they'd been knocked by furniture removals over several decades. 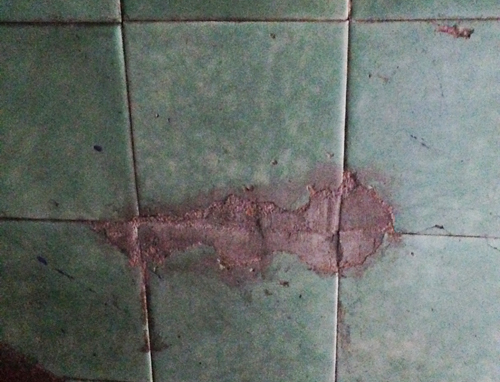 Bailey Garner suggested the smaller holes could be made good with a filler dyed to match the tile, but this idea was never adopted. 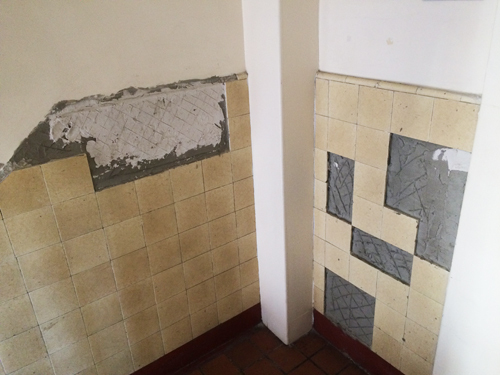 Over the Christmas period 2015-16, tiles were identified for replacement by the MITIE Contracts Manager, who went round the blocks with a can of yellow spray. 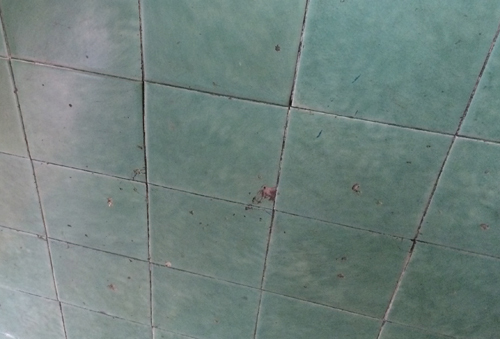 His markings were highly arbitrary; some quite damaged tiles were not marked; others with only tiny pits were included while right next to them others with similar pits and marks were not. Block reps were then told how many tiles would be replaced in their blocks. The Holden House rep was told that 96 tiles would be required across Holden's three stairwells. But already, a far greater number than this had been yellow-marked. 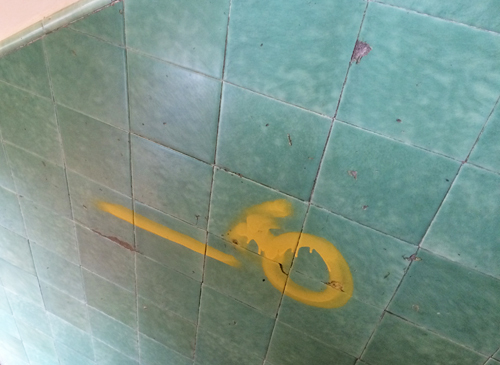 On 11th January 2016, workers began hacking out the tiles at Holden. 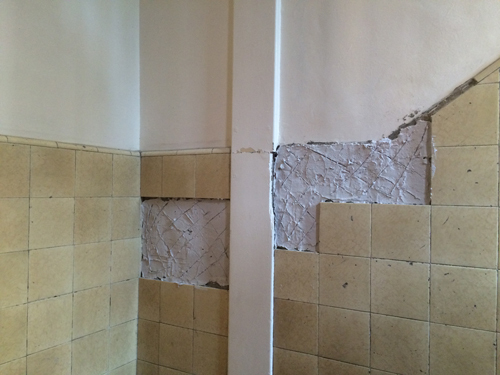 At first, only the tiles themselves were removed, and MITIE's workers were able to remove a tile without damaging too many of the others around it. But behind the 6mm thick heritage tiles was half an inch of 80-year-old tile adhesive that was very solidly stuck to the wall behind. If none of the adhesive layer was removed, only a very thin layer of new adhesive could be applied to fix any new tiles – which had been specified to the exact size and thickness of the old tiles (6mm). These could not be bought off the shelf and had to be specially made. But the workers had not been told to hack off the old adhesive. It became clear that there was no methodology behind the task. When this was pointed out to the Major Works project manager in an email, she did not reply. 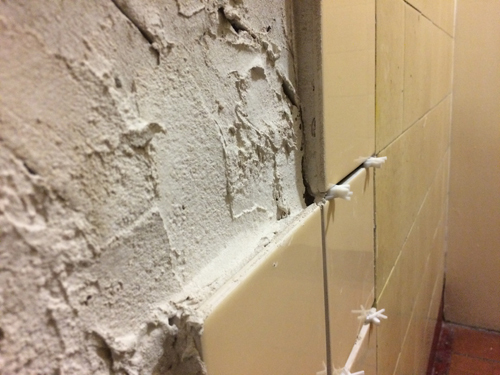 But as tile removal progressed, the old tile adhesive began to be hacked out as well – in a very uneven fashion with the work proving extremely noisy and difficult. As more force needed to be applied, the greater was the collateral damage. 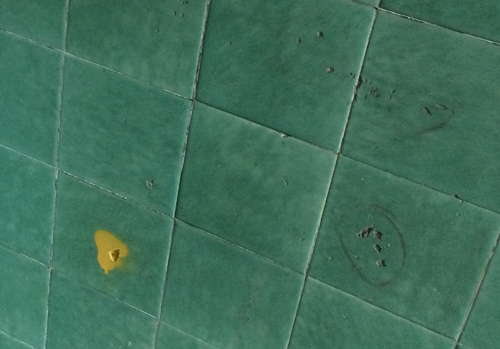 We have added a yellow overlay to show the tiles that had been marked for removal. After three days of hacking out, one stairwell alone had had about 82 tiles removed, already 86% of the estimated tile replacement for the whole block. At that rate, it was likely that over 250 new tiles would have to be fitted – much more than twice the original estimate. So how many 'specially' manufactured tiles had been ordered? We had been told that this work had already been delayed by several months because the new tiles took a long time to make. It seemed likely that a contingency might be allowed, but it was going to have to be seriously large contingency to account for collateral damage. 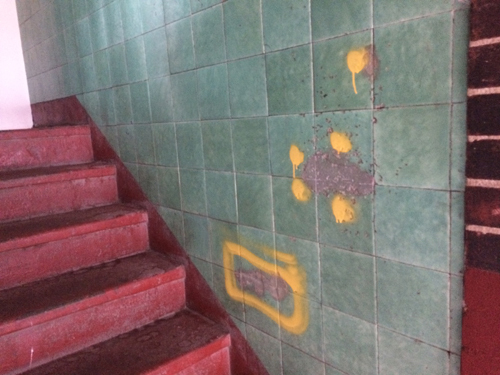 As the hacking out job neared completion on the third stairwell at Holden, workers informed us they'd been told by the site foreman not to bother hacking out some of the yellow-marked tiles. Failing to monitor progress as the work went on, MITIE's site foreman had finally realised the job had already expanded way beyond original estimates. 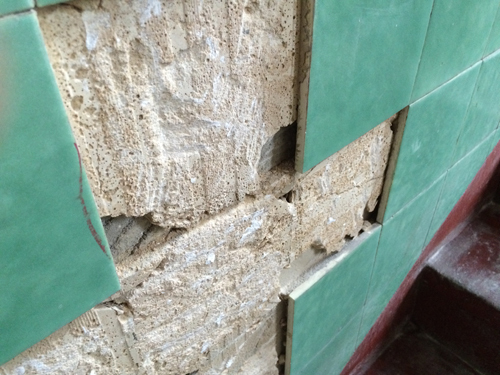 At the end of January, 6mm thick replacement tiles began to go up in the first stairwell at Holden. There obviously weren't enough tiles ordered to complete the other two stairwells in the block; these were not re-tiled until the end of March. The new tiles are not an exact match for the old ones. But that's of little concern compared to the number of undamaged tiles that had to be replaced, whilst a lot of badly pitted ones remain. This is especially evident at the stairwell entrances, which have the most traffic, and which are the first tiles one sees when entering the block. • these did not require all the extra hacking out that took place six months earlier that had damaged so many perfectly good tiles and increased the number of tiles that needed replacing. 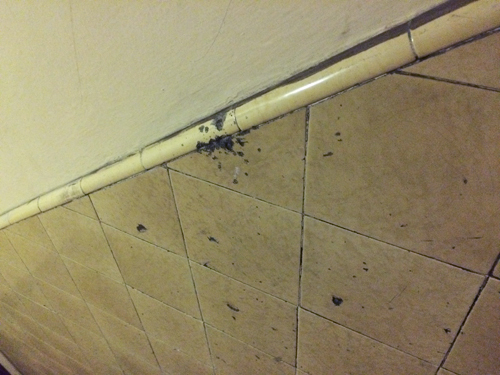 "She was totally unreasonable and defensive, as usual, and wouldn't tell me anything useful about how the final amounts/costs for the tiling process would be calculated for the bill except this: once the work is complete she will look at what's been done, look at the original number of tiles identified in the walkabouts as needing replacement and then "make a recommendation" to LH as to what the final cost should be. "She wouldn't tell me anything about the basis on which this recommendation would be made, how any calculations would be made etc. and said I was asking for confidential information when I asked for these details. She also said if I wanted to know more I should 'get a job at Lewisham Homes and then she'd be at liberty to talk to me about it'!!!!"